(May 31, 2006) If you read any of my other accounts here at my Airstream site you may already know I have this little company called DigitalSoundboard.net. I travel around the country with my Airstreams recording live music wherever it may be happening. Most recently I traveled up to New England to record live performances at a wonderful little (2,000-3,000 people) music festival called Strange Creek Campout. We've been recording at this event for the past few years. Needless to say, it's a great time and always offers an amazing musical experience. Here's a little backgrounder on my biz - we take a feed from the soundboard and position microphones strategically around the stage and mix the two audio sources to give us the best results for our live recordings. Once the music is recorded, we bring the recordings back to my Airstream where we mix it down and burn the music on to CDs. We then offer the CDs for sale about an hour after a band walks off the stage. YES...I love my job. The fans love the keepsake recordings and the bands enjoy the added income. It is this endeavor that got me started in Airstreaming to begin with. In my civilian festival going life our family were tenters. With the birth of DigitalSoundboard in '03 we needed a more substantial mobile workplace and an Airstream was the ONLY option. The trip began on May 24th with a quick drive to Jersey Shore Haven Airstream Park to pick up our '78 Excella 500. On May 25th I made my way to Camp Kee-Wanee in Greenfield, MA which serves as the festival grounds. 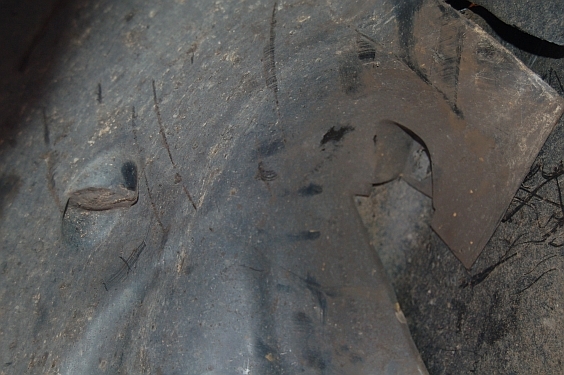 I've been thinking about the trailers tire condition for the past couple of years. They were the one unknown when we bought the trailer back in 2003 and I've kinda been rolling the dice on every trip I've taken with the trailer. They were holding air and the tread was still deep. Visually, the tires looked okay and spending upwards of $500 on new tires was something I was gonna do before the "next" festival. The obvious mistake has now been stated and here's how this nightmare went down...I left the festival on Monday (Memorial Day) and was heading back to Jersey. I was traveling south on the New York State Thruway at about 60 MPH. I was dead tired from a weekend of working long days and nights getting the music on the table. I was about three quarters of the way home and was contemplating pulling over at a rest area to catch a little nap when I hear a loud BANG - it sounded just like a car back firing which is what i thought i heard. I look in my side mirrors and I see debris flying out from the trailer. YIKES it was ME! Needless to say I woke right up. I immediately pulled on to the shoulder. Jumped out and gawked what had happened. It looked like a stick of dynamite had been set off in my wheel well. In rapid fashion I changed out the blown tire with the spare which thankfully still had air in it. I made my way to the next rest area to put more air in the spare. While there I check the pressure on the tires and all were at 70 psi and hot. Cold I had the tires at 65 psi which was the maximum allowed pressure when cold indicated on the tires. 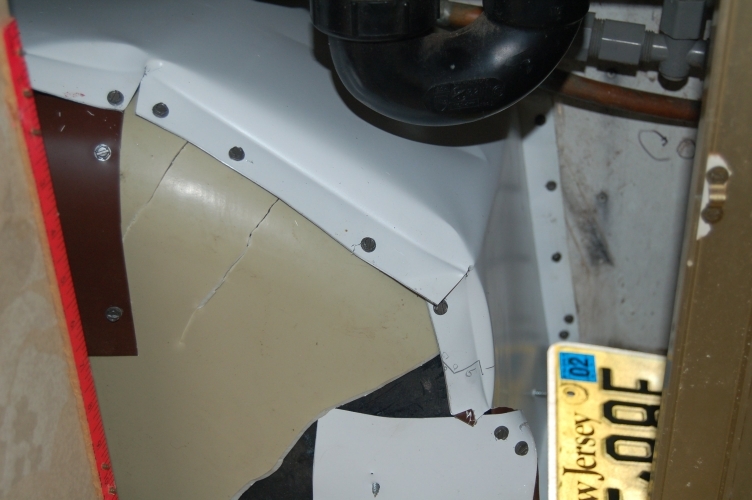 I've already entered in discussion on AirstreamForums.com on how to go about fixing the damage. The smartest bit of advice was to let the insurance company fix the problem. If it was my '93 Excella 1000, the wife's Airstream ;-) there would be no question, the trailer would be heading to South Jersey RV or GSM Vehicles to be repaired. But my deductible is $500 or $1000 and I hope to fix this damage for less than that not including my time. Amazingly the plumbing is intact. Others, as I have read on the net have not been so lucky. I've heard of plumbing being wiped out and sewers being destroyed by blown tires. As I see it so far, the floor will somehow need to be patched. I'm thinking fiberglass and epoxy. 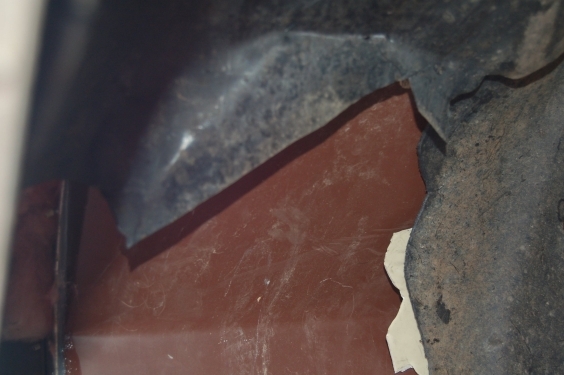 The external wheel well needs a new plastic liner. I'm thinking a visit to the junkyard tomorrow. 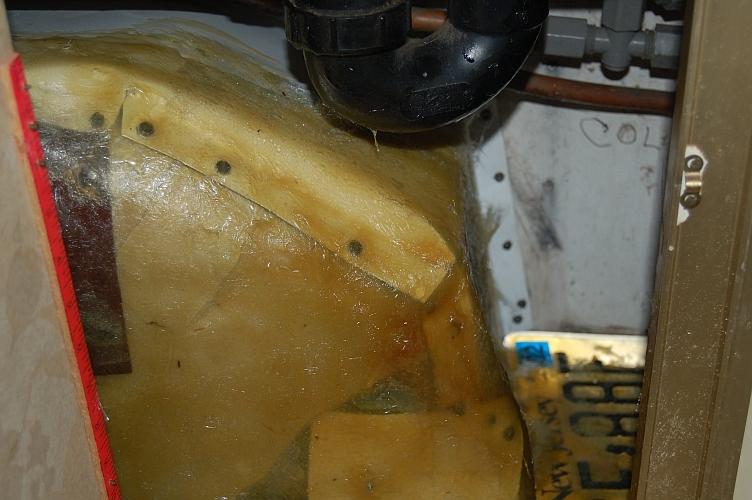 Then there is the task of repairing the internal plastic wheel well - again fiberglass and epoxy. Then finally the aluminum skin will need to be patched up. And I'm on a deadline. When I'm not using this Airstream at festivals our Excella 500 serves nicely as a guest trailer at Shore Haven. We've got friends scheduled to visit for the Forth of July. While Katy and the kids are at the beach the next few weekends you know where I'll be...knee deep in epoxy. Yes, four new tires were mounted on the trailer today (5/31/06) for... cha-ching...$450. I'll offer updates here as this repair project progresses. Here is a very informative link from HowieE - Michelin provides two RV related tire videos. Both are excellent and worth watching. In addition, Michelin offers an RV Tire Guide here. "You are carrying way to much pressure in the trailer tires at 65 psi. Take the truck and trailer to a scale and weigh each axle to determine the tire pressure you should have against the tire manufacture's chart. Also check the date code on the other tires. 7 years is about the limit. As for the truck I would inflate those tire to the load when the 34 footer is hooked up. I carry 45 in my front tires and 55 in the rear with the door panel calling for 80." Maybe if tires are going to be blown up, the wheel wells should be made of steel, not plastic. 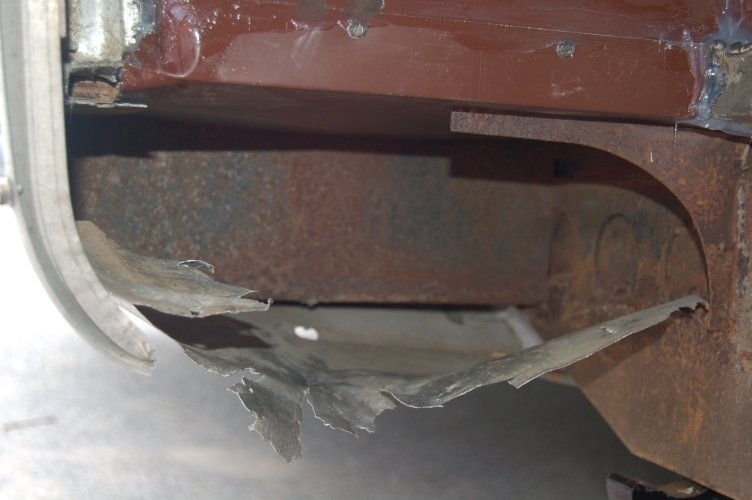 Such as commercial trailer fenders with flat tops. On my single axle Caravel I've not yet detected tire heating. I've checked at 5 miles, 50 miles and 200 miles in the middle of the summer and the trailer tires barely warm to my hand touch. The tires on the sunny side tend to be warmer, hinting the heat I see is more sun than friction. The multiple axle Airstreams are not equalized, each axle takes a share of the load depending on the stiffness of the suspension on that axle and the tilt of the trailer. E.g. nose high puts more load on the rear axle. Unless the trailer has been parked most of its life with tongue high to compress the rear suspension more. And elderly axles that have hardened elastomer will do an even poorer job of load sharing because of the stiff suspension. 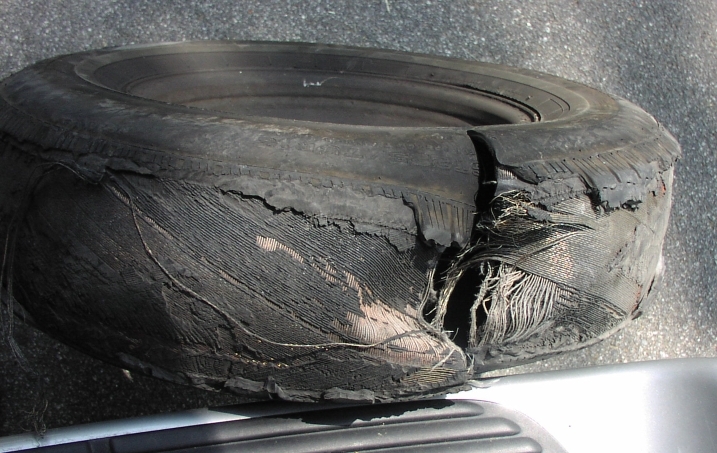 (from road hazard or sloppy manufacturing) will lead to this problem of a tire overheating. Or more than one tire overheating. I think that weighing needs to be done per axle, not just the total weight. That's to be sure the suspension is distributing the loads more or less evenly. There may need to be a hitch adjustment to balance the axle loads to keep them within the tire load ratings. It might be necessary to run higher pressure on one axle because of that imbalance in load sharing. Running tires at maximum pressure gets the maximum load rating but when the axles are stiff one can gain much load sharing and a softer ride by reducing the tire pressures down to something just above what it takes for each to carry its load. But tilt and history may make that load sharing not quite what one would anticipate by weighing the entire trailer and dividing by the number of tires. A good scale with a flat approach (not all do have a flat approach) can allow weighing on axle, then two axles, then three axles to see how much each contributes to the load carrying and to see if any are overload and any are shirking their part of the load. I didn't get hot tires with the aged bias ply tires and I don't get heat with the radials either (and radials in my nearly 40 years of using them on cars and trucks do run much cooler than bias ply tires) on a single axle trailer and I don't think a multiple axle trailer should have a tire heating problem unless there are other problems like alignment and load sharing. -- Gerald J. Dr. Gerald N. Johnson, electrical engineer WBCCI #5623, VAC All content copyright. I spent my eighteenth wedding anniversary fixing the blowout damage while Katy went for a hike. I went over to my sister Diane's house in Kinnelon where the trailer has been parked since the incident to embark on the repair of the damaged wheel well. I got there and pulled the "new" rear curbside tire off to once again asses and determine who to tackle the job. A couple of days prior i went to a local junkyard and bought a wheel well liner that I knew was ultimately going to be the finishing touch on the job. While sitting there gazing at the damage and trying to figure out next steps my brother-in-law Rob walked over from the side of the house. As chance would have it he was in the process of siding their new addition on the house. I told him what I was up to and he said he would take a look and see if he could help. He just happened to have rolled aluminum out along with an aluminum break. Rob promptly took out the tape measure and I backed out of his way. If you can offer any advice or comments on ANY of this, please email me at dave@dwmorrison.com.